This book is a mix of scientific studies & personal anecdotes that gives this book a unique look into the lives if parents. It’s not an advice book. Just a heartfelt account of why and how children effect our lives so strongly from birth. It also discusses the roles of modern patenting & its evolution over time. I listened to the audio book, narrated by the author. As a new mom, my son was a year old when I first listened to this book, the stories and science resonated sharply with me. I think this should be given to all new parents, or expecting parents. Its offers such a better and objective perspective of the strain and struggles of parenting on the parents. So much of parenting is focused on the fetus, the infant, the toddler and the teen. This book does a great job filling in that void. Although its been a few months since I last visited this book, I think it has impacted my parenting philosophy in little ways. For one, I make sure to my relationship with my husband a priority and I really don’t stress over the small chores of daily life. I enjoy every moment I have with my family. One of Senior’s most prominent facts is that the year after a child is born, is usually the year when happiness in marriage starts its slow decline. According to the author, it happens anyway, but there’s a sharp dip right after a new child is born. New and fussy infants do put a huge strain on parents. You question things about yourself and your spouse you never even realized existed. But, I think the true test comes with handling these hurdles. 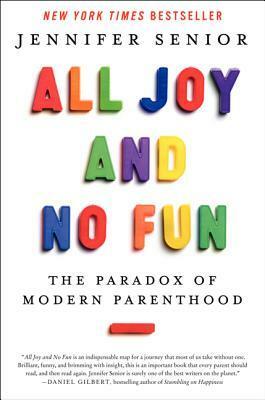 This is a funny, insightful and fairly accurate book of what happens after the kids are born. There is so much in this book that resonated with me, that helped me understand that what I was going through was normal and that I wasn’t alone in those feelings and thoughts. It is not a parenting book or a how-to manual. Just a simple analysis of different studies, polls and anecdotes of what this generation’s parents are experiencing. This entry was posted in Books and tagged all joy and no fun, Book review, jennifer senior. Bookmark the permalink.